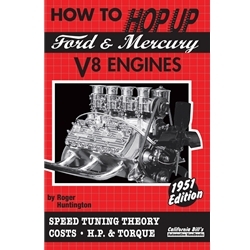 Speed tuning theory and practice, costs, horsepower and torque for all 1932 and later Ford & Mercury Flathead V8's. Details on planning the modifications, fitting the block, boring and stroking, flathead and overhead-valve cylinder heads, cams, pistons, rings, intake manifolds, exhaust headers and special ignitions. A special chapter discusses superchargers. This Roger Huntington classic will help you understand how things were done around 1951. Shows classic speed equipment developed and manufactured by Ardun, Belond Besasie, Champion, Frenzel, Harman-Collins, Hilborn, Howard, Iskenderian, Italmeccanica, Kong, Mallory, McCulloch, Navarro, Offenhauser, Roemer, Smith & Jones, Spalding, SpeedOmotive, Stephens, Tattersfield-Baron, Tornado, Vertex, Weber and Winfield. Explains the V-8 family tree, planning the job, block modifications and assembly, cylinder heads, carburetors, estimating horsepower and how to get the most performance for your money. A classic guide for any auto buff's library.